Review of the movie 'Cesar Chavez' | Fight Back! Los Angeles, CA - The movie Cesar Chavez by Mexican actor/producer Diego Luna again puts the public eye on the injustices and harsh working conditions of the mostly Mexicano farm workers in the U.S. It also covers the early history of the United Farm Workers Union (UFW) and its first strike and the successful grape boycott against the growers. The movie was funded by mostly Mexican investors and shot entirely in Sonora, Mexico, as it was not a priority for U.S. film makers. The movie mainly covers the first 10 years of the UFW farmworkers struggles, beginning with the grape strike in 1965. The boycott that followed gained national support and helped to win the first UFW union contracts in 1970. 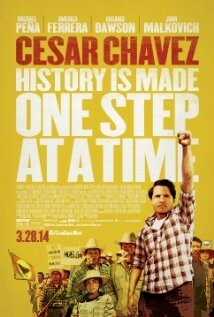 The movie goes on to show the role of Cesar Chavez, his family and Dolores Huerta working with others to start the UFW. It does point out the important role of Filipino farmworkers who started the famous strike in August of 1965. In one short scene it shows Chavez talking with farm workers at a house meeting, asking questions about the work conditions and asking them what they want to do. He was known for his one-on-one organizing skills. It does show briefly his start with the Community Service Organization (CSO), an early Mexican-American civil rights group. One thing I enjoyed about the movie was seeing Chicano and Latino actors and actresses playing important Chicano historical figures in our fight against racist injustice. Chavez is played by Michael Peña, who I met on the set of Walkout where he played teacher Sal Castro. America Ferrera plays Chavez’s wife, Helen, and Rosario Dawson is the vocal UFW leader Dolores Huerta. The movie does point out the important role of the women in the founding and actions of the UFW. Overall, Cesar Chavez was a good movie, especially for those who know very little of this period of struggle in our Chicano history. The movie shows the brutality of the police and large ranch owners toward the Mexicano and Chicano farmworkers. It shows the oppressive working and living conditions of farmworkers in the fields and crowded living conditions in the farm camps with very low pay. When the farm workers organized with the UFW they faced the power of the state, including court injunctions, police brutality and mass arrests. On a personal note, I met Cesar twice, once at a grocery market boycott activity and later at Talpa Church in Boyle Heights for a 75-year birthday event for Fred Ross, who had worked for Saul Alinsky and had helped to recruit Chavez to the movement. Chavez always appeared a quite unassuming person. What the movie did not show was the support and solidarity the boycott received from the Chicano movement, with many organizations supporting the UFW, especially in the large cities. We saw the UFW as part of the Chicano movement and our struggle for equality. The Brown Berets joined the UFW picketing at the Los Angeles produce market to protest the delivery of grapes. Also the Chicano student group La Vida Nueva - The New Life - at East L.A. College protested and demanded that grapes be taken out of the student cafeteria. As a short movie it lacked the total story of Chavez and the UFW and did not show the later leadership weaknesses and the decline of the union, which has recently been documented in various new books. ¡Viva la Huelga, Viva la Union! Carlos Montes is a longtime activist in the Chicano community in Los Angeles and was a leading member of the Brown Berets in the 1960s.